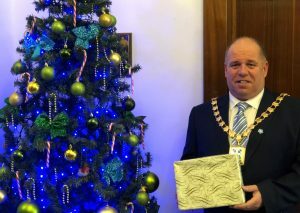 Sefton’s Mayor is once again asking as many people as possible across the borough to get behind this year’s Christmas gift appeal. Each year thousands of kind hearted residents donate toys, gifts and stocking fillers to some of the borough’s most deserving children to make their Christmas extra special. Gifts, for children of all ages, can be taken to either Bootle or Southport Town Halls or dropped off at any Sefton Council library or leisure centre by Friday December 21. Residents can also donate at the Asda stores in Bootle and Central 12 in Southport. Gift tokens are particularly welcome to be given to older children. All presents will then be distributed to children and young people throughout the borough by volunteers from Sefton Council and Sefton Children’s Trust on behalf of the Mayor. Cllr Dave Robinson, the Mayor of Sefton, said: “Every year thousands of people who live or works in Sefton donate a present for the annual Mayor’s Christmas Gift Appeal. “Their generosity is amazing and I’m hoping 2018 will be no different as we make Christmas that little bit more special for those less fortunate. “Any donation is welcome and we are looking for gifts for all ages from babies and toddlers to teens. Letty Draper, ASDA Community Champion, added: “Please take the time to either donate an unwrapped new gift or toy in to the Christmas gift trolley at either of our Bootle or Southport stores. For further information on the Mayor’s Christmas Gift Appeal please call 07837863075.